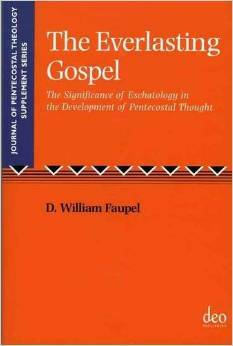 The Pentecostal Message: In this chapter Faupel explores the pre-formation of the Pentecostal message. He relates its content to the Full Gospel, which includes: salvation, sanctification, baptism with the Holy Spirit, healing and second coming. Context of Pentecostal Thought: In this chapter Faupel gives a brief sketch of the American context at the end of the 19th century. His focus on the American culture as ground for Pentecostalism, however, seemed quite narrow especially in retrospect to the original glassolalia experience by the disciples on the Day of Pentecost. The Pentecostal Message: Faupel offers an interesting observation on the lives, messages, ministries and outcomes of three major pre-Pentecostal American figures. He writes of J.A. Dowie. Frank W. Sandford and Charles Parham. The Coming of the Latter Rain: Faupel begins the story of Seymuor as a continuation of the historical formation of the Pentecostal Movement linking it back to the ministry of Parham. He explores the beginning of the Azusa Street revival and its affect on Los Angeles, the United States and worldwide. Defining the Parameters of Pentecostal Though: The end of Faupel’s story focuses on the outcomes of the Latter Rain phenomenon. Main concern of the plot is the ministry of Durham in Chicago, who proposes the idea of Finished Work. Durham claims that thought Calvary there are only two works of grace, the salvation experience and the baptism with the Holy Spirit. The sanctification, he proposes, comes in the life of the believer through the salvation experience.